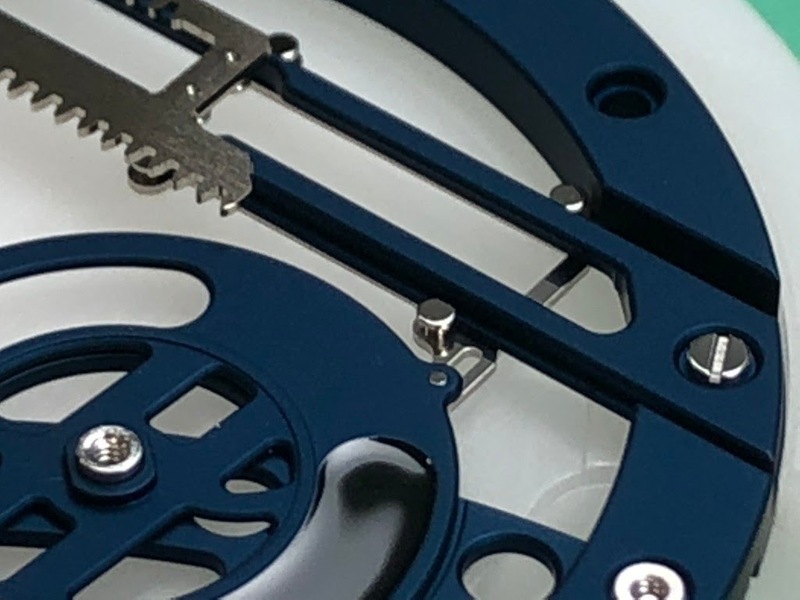 My passion for mechanical watches is largely based on the small and fine technical and mechanical solutions that engineers and watchmakers find to make our watches so special. 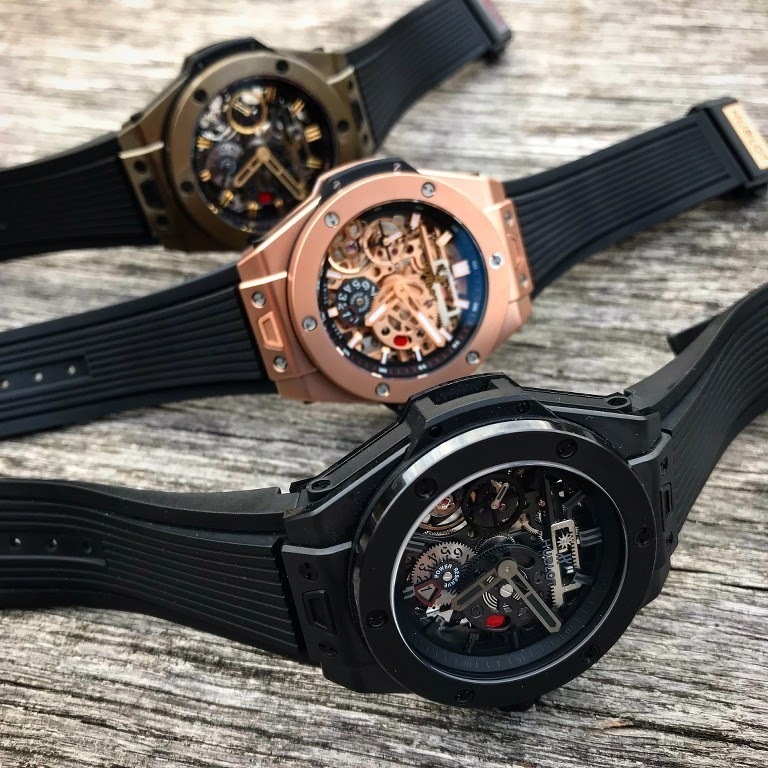 And so the Hublot Meca 10, more specifically the HUB1201 caliber, is a good example of what makes my passion for watches and mechanics so special. 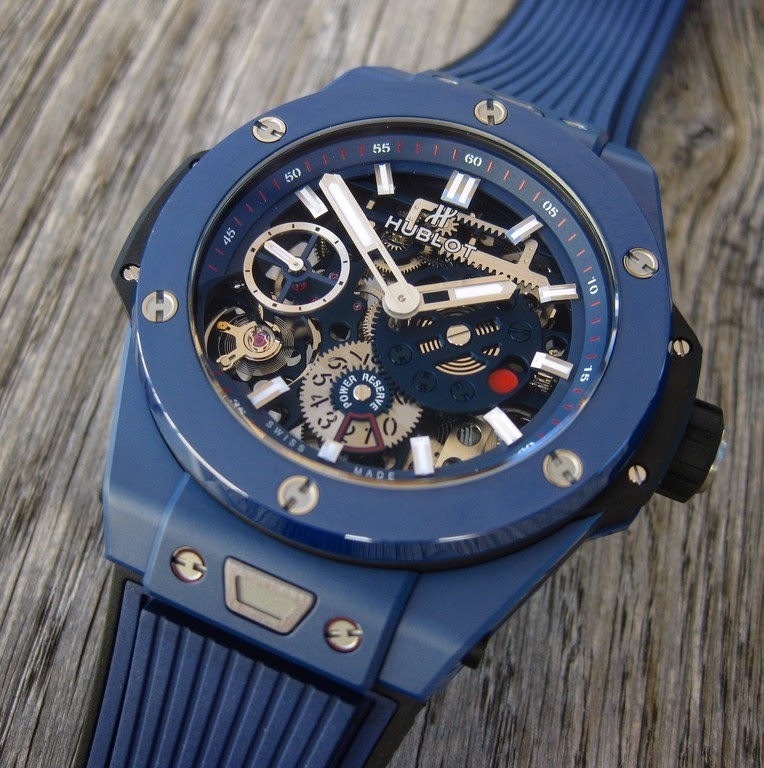 The idea for this unusual timepiece came from Mathias Buttet, the ingenious spirit of Hublot, around the year 2011. 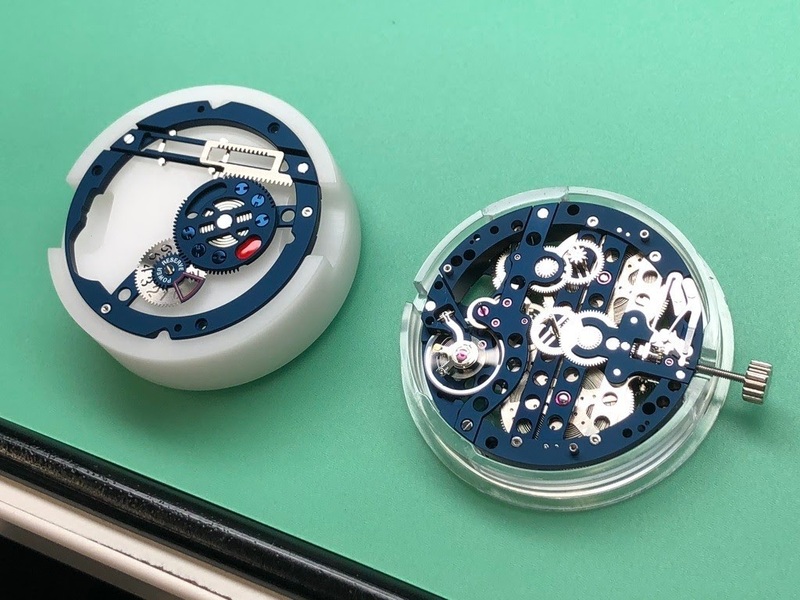 Mathias is the man who developed the scratch proof 18K Magic Gold, the first really red ceramic and many very complex movements like the HUB9005, a Tourbillon with 50 (!) days power reserve. And he is very active in the research around the Antikythere-Mechanism (but that´s another story). Basically, a movement should arise that should provide maximum flexibility in the eventual completion of complications. The basic construction should therefore be as flexible as possible. 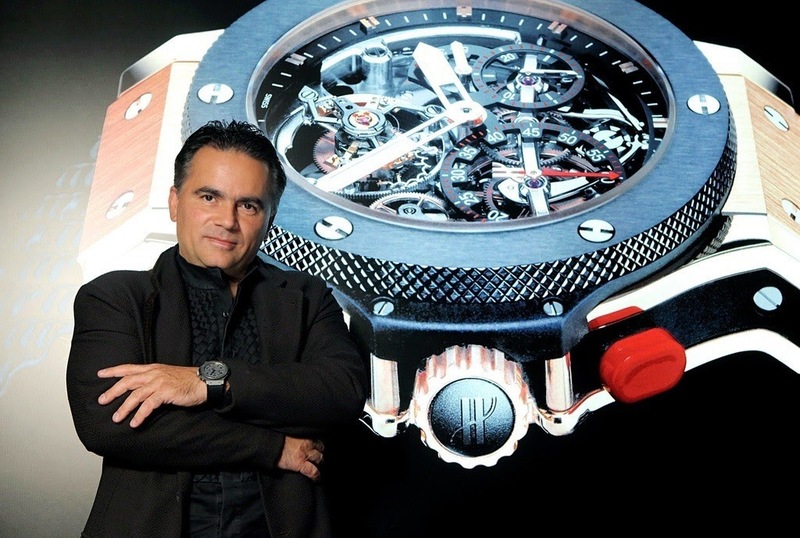 Mathias involved Christophe Lyner (see the picture above, the guy on the left, on the right you see Jacky Rousselle), a very capable and innovative engineer who is responsible for the development of new movements at Hublot and has also been involved in movements such as the Unico 1 and the Unico 2. Todd also knows him well. It took almost 4 years to develop that movement. 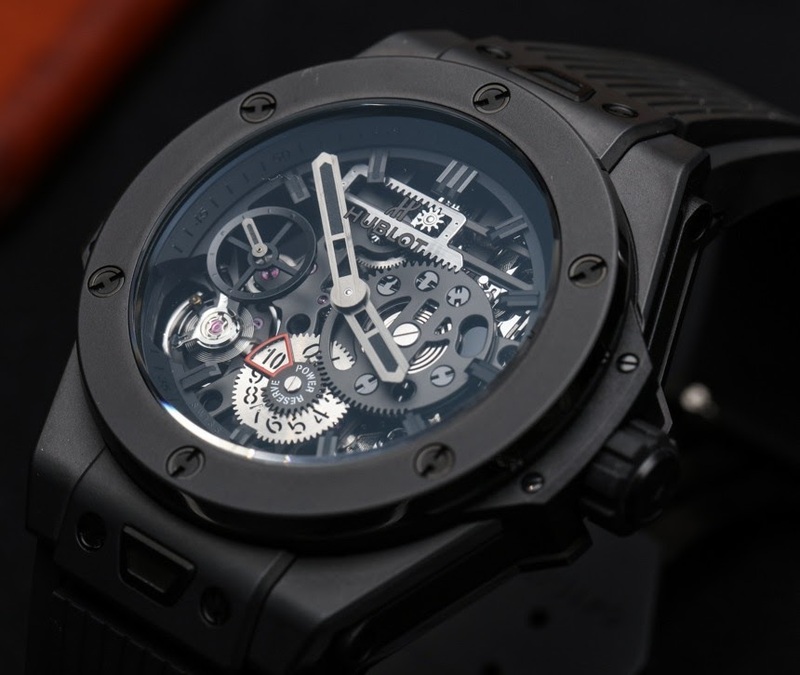 In 2015, the first prototypes were completed and in 2016, the 10th anniversary of Hublot's All Black concept, the Meca 10 was then presented to the public. Both, Mathias and Christophe, decided to create a movement without the usual main plate. 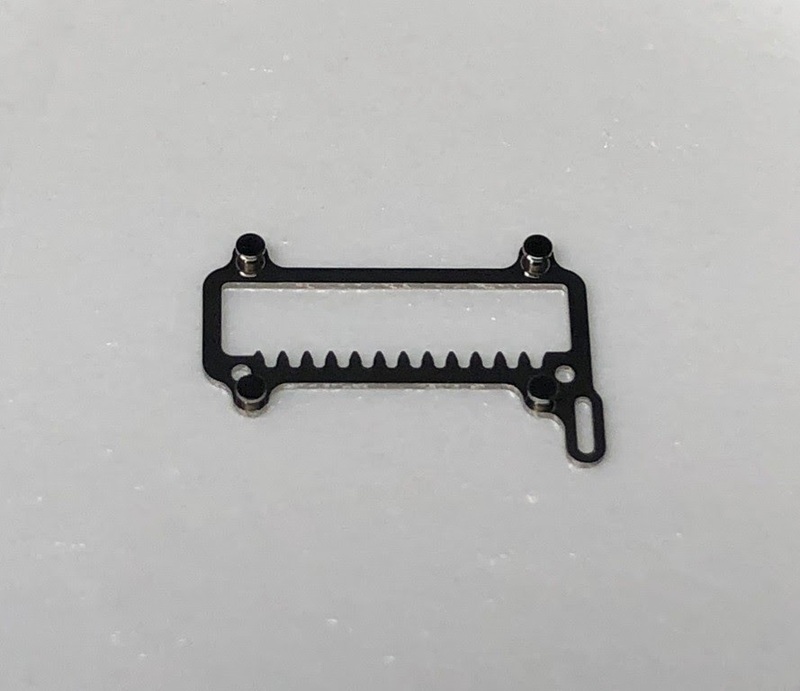 The omission of the main plate leaves the engineers all freedom in the design. On the other hand, it also brings many challenges. 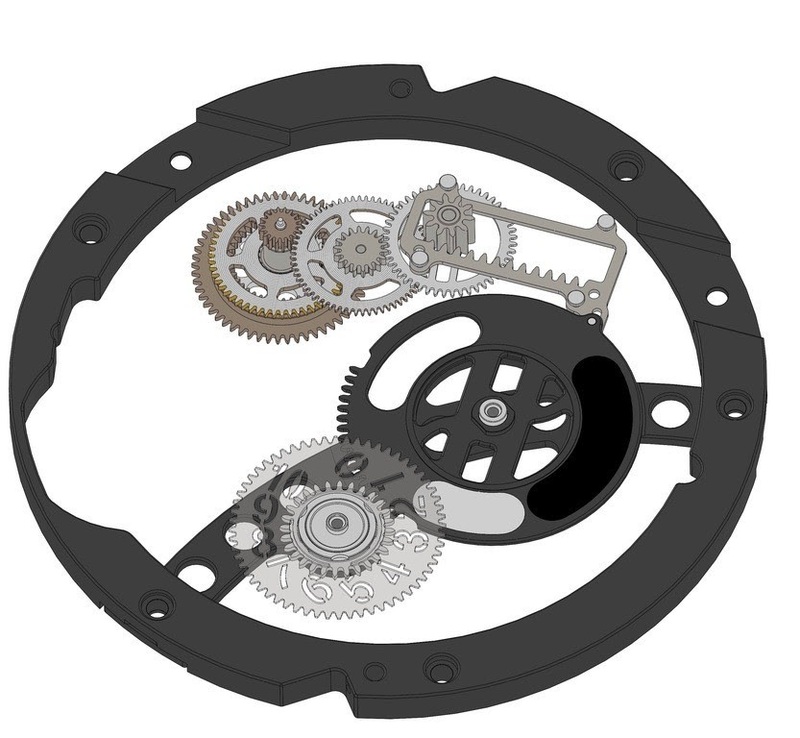 Static, the HUB1201 is based on a circumferential ring to which flat bridges are attached. 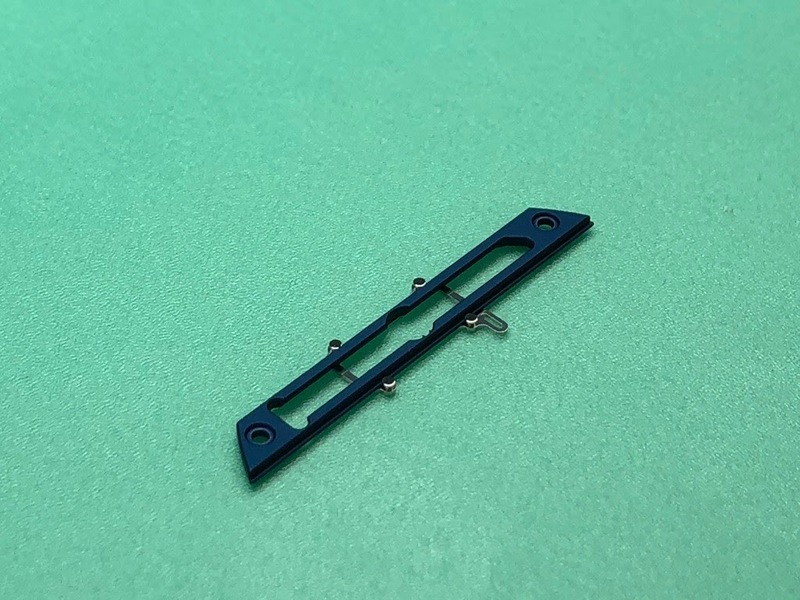 These then carry the individual components of the caliber. 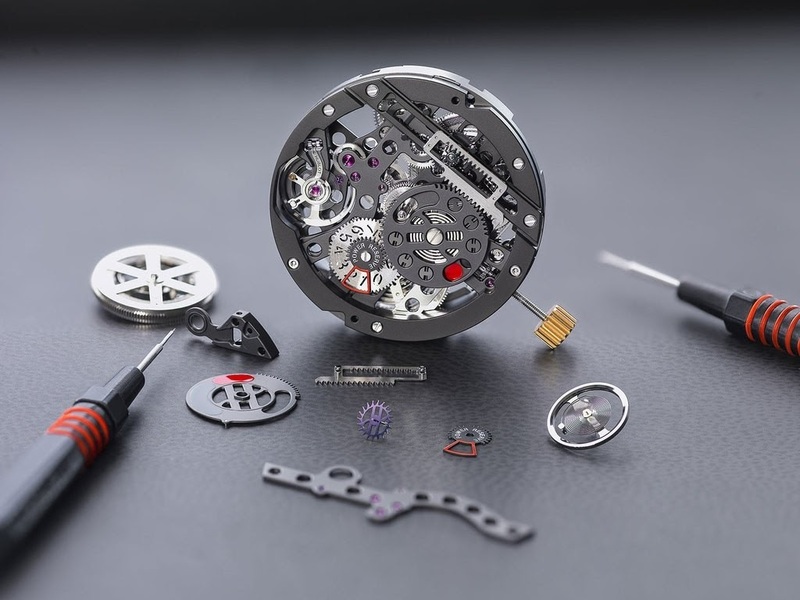 Since the description of the complete caliber is very extensive I would like to limit myself today to the construction of the power reserve. This in itself constitutes a complication in the manner it was designed. At a later date, I will describe the basic caliber and its technical finesse in another post here in the forum. 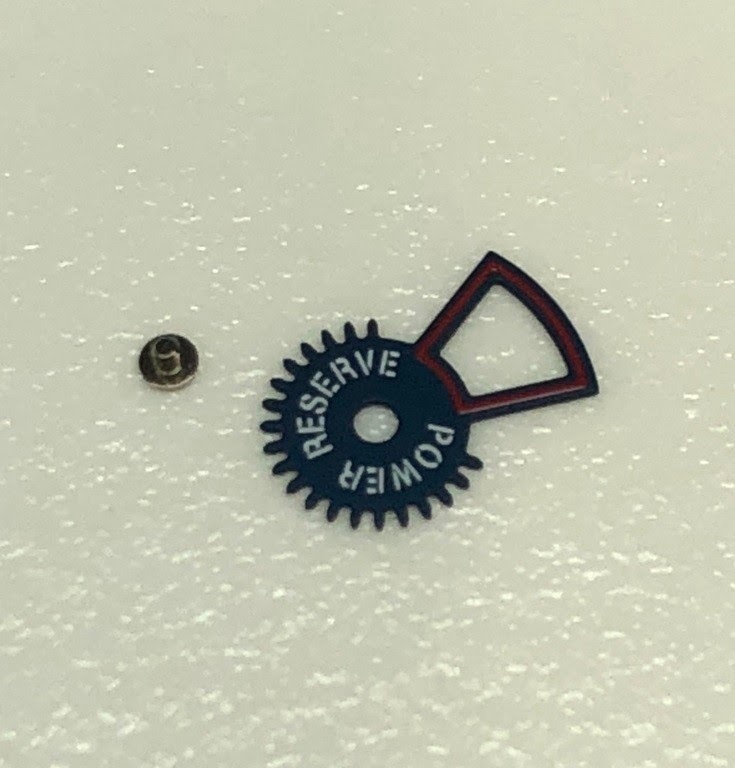 The power reserve mechanism of the Meca 10 (see the picture above, on the left) is a complex assembly consisting of more than 30 individual parts, which can be mounted as a module on the base caliber (see the picture above, on the right). 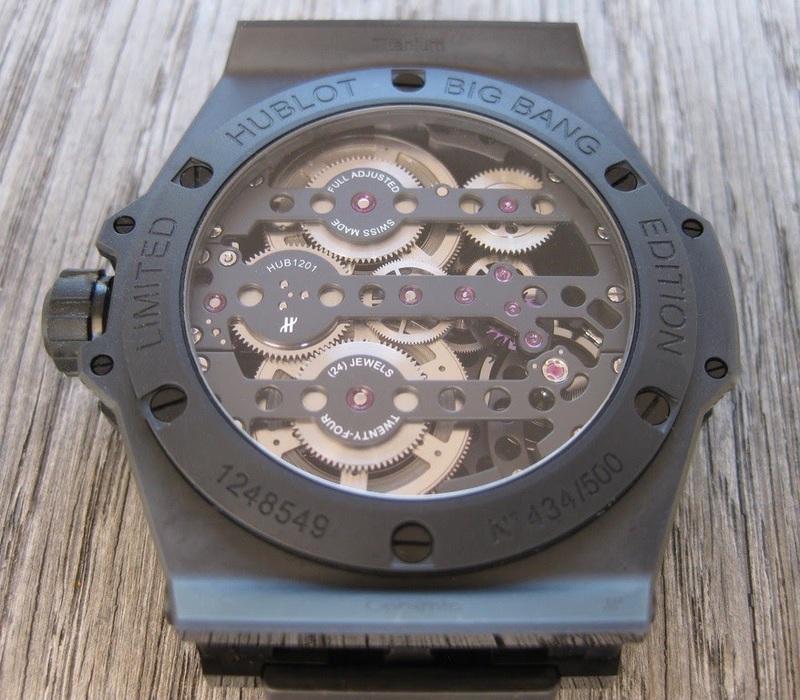 This design shows that the base caliber has been designed for the later addition of further complications. 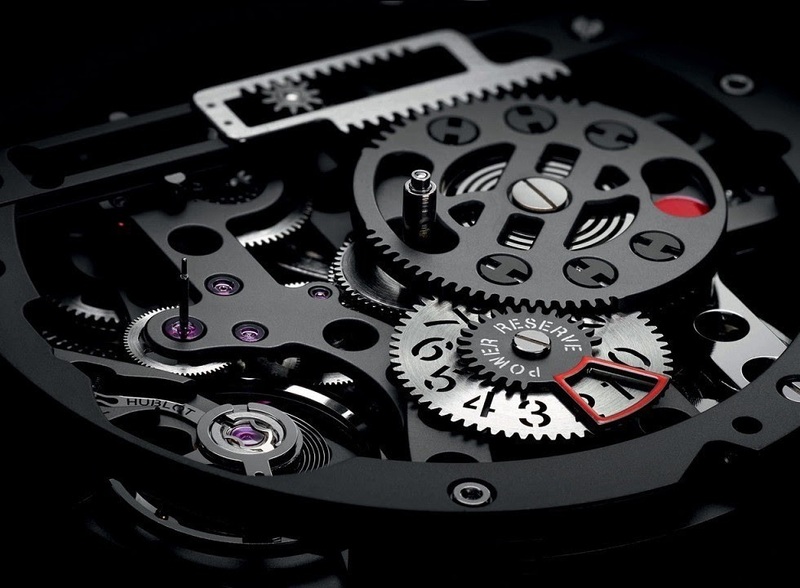 Similar to the power reserve display, other mechanisms can be added to the base caliber in the future. 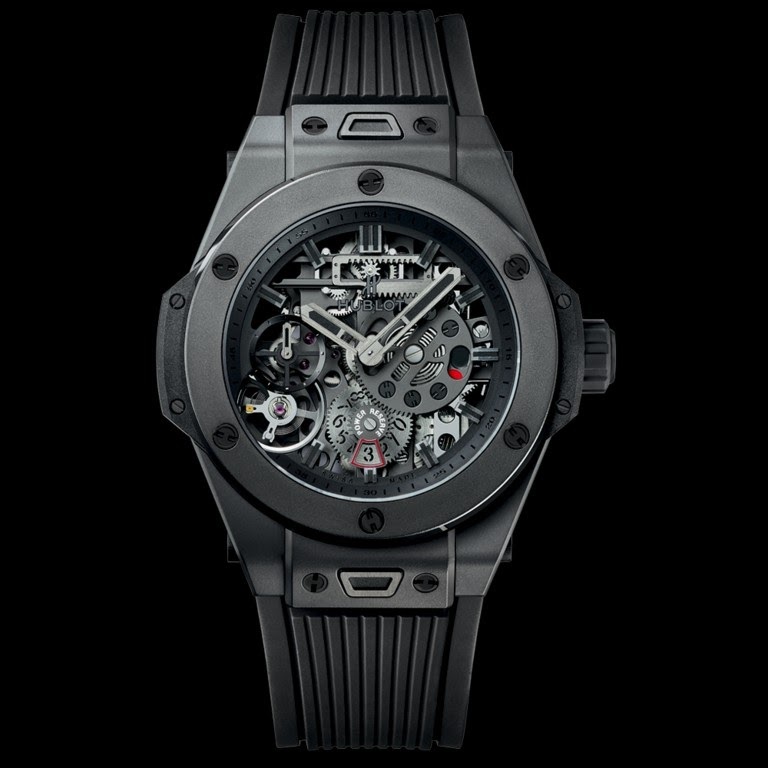 With its two barrels and over 10 days power reserve, the manual winded movement has sufficient power. Let's start on the back of the clock. You can immediately see the two large barrels. 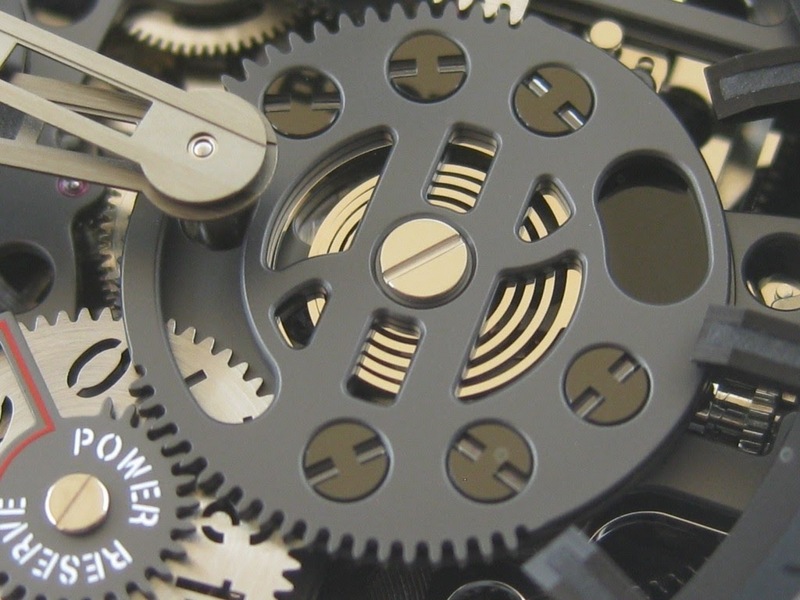 The power reserve is transmitted to the dial side via a small wheel that contains a planetary gear. 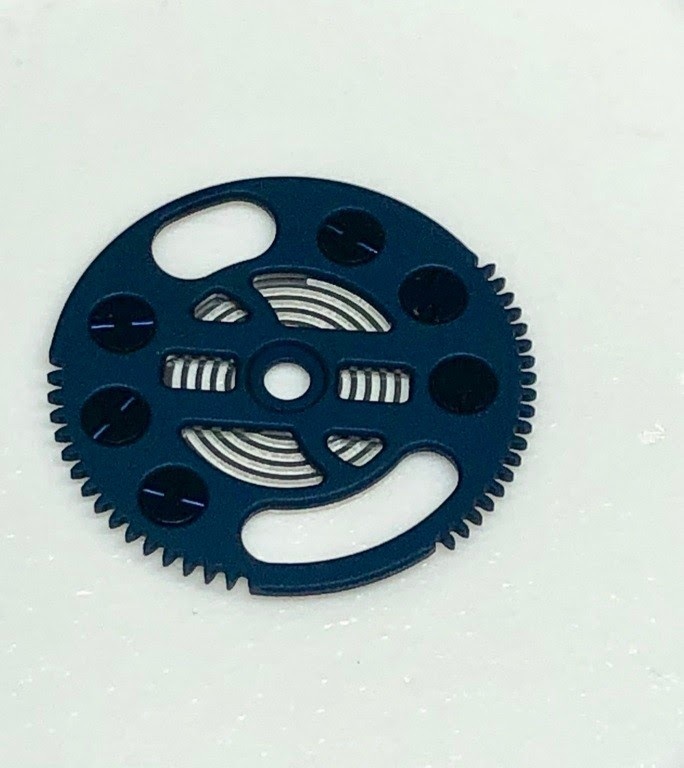 There is a separate gear train used for the power transmission to the escapement. 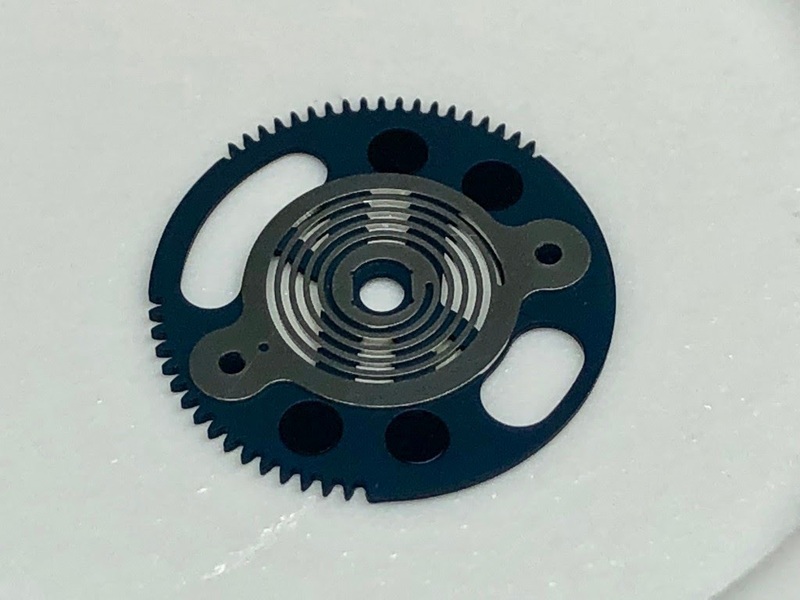 This planetary gearbox saves a lot of space and can be omitted with other expansion stages with other complications without it having consequences for the function of the base caliber. 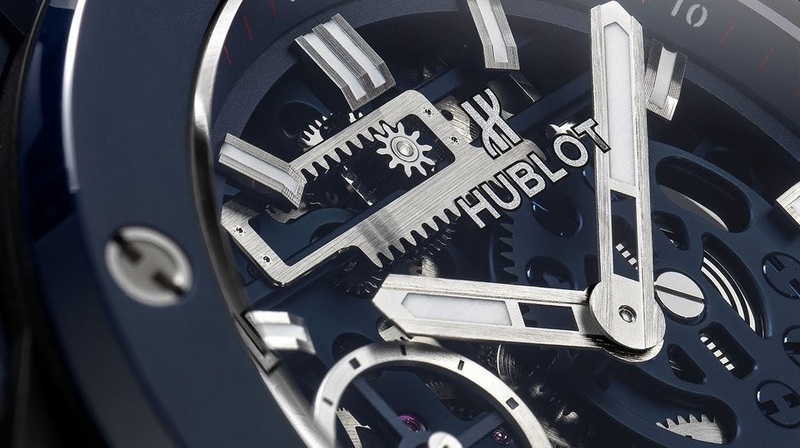 Now let's look at the dial side of the watch so we recognize a big rack at 12 o'clock. 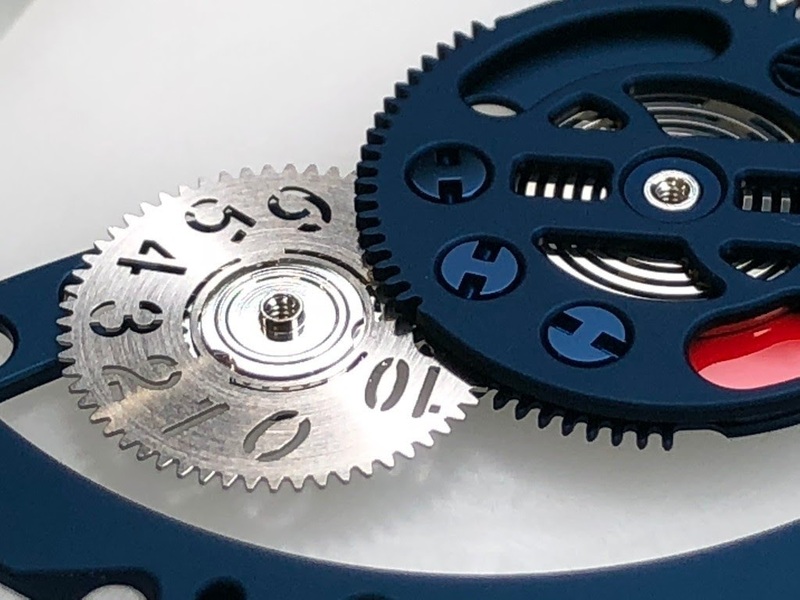 It is one of the distinctive distinguishing features of the Meca 10. 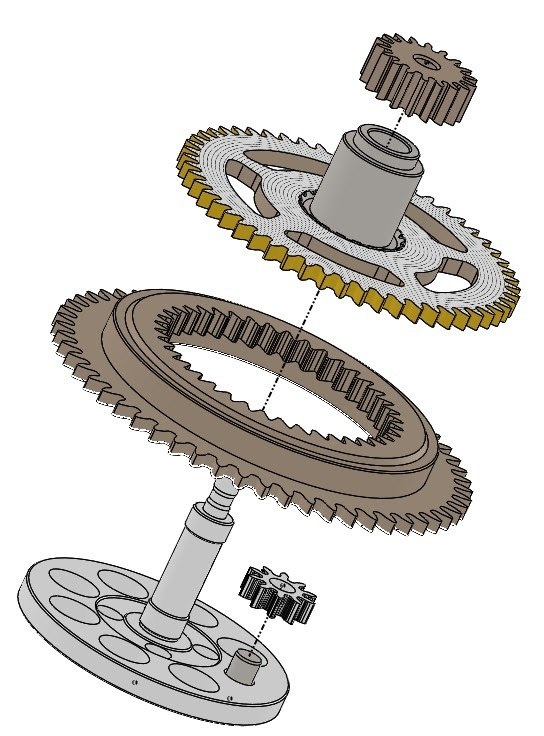 This rack, in fact, there are two superimposed racks are connected via a gear train with the planetary gear. 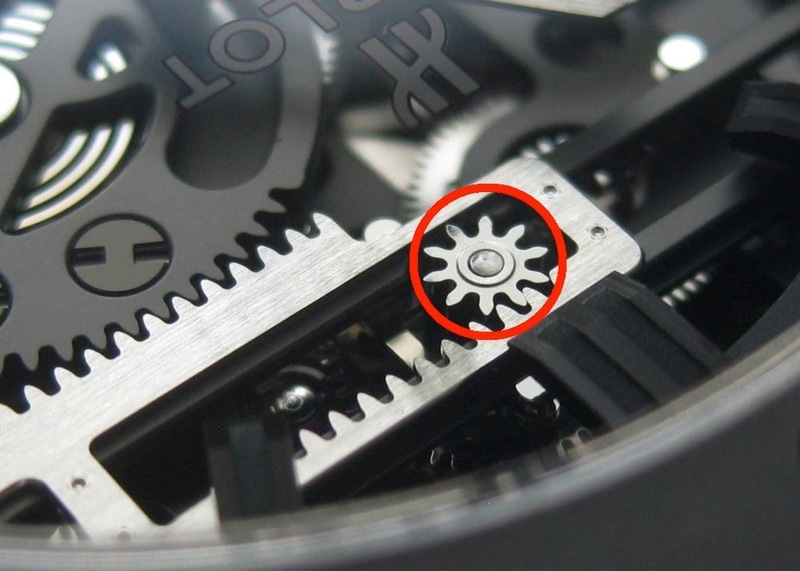 See the gear train marked in the following picture. 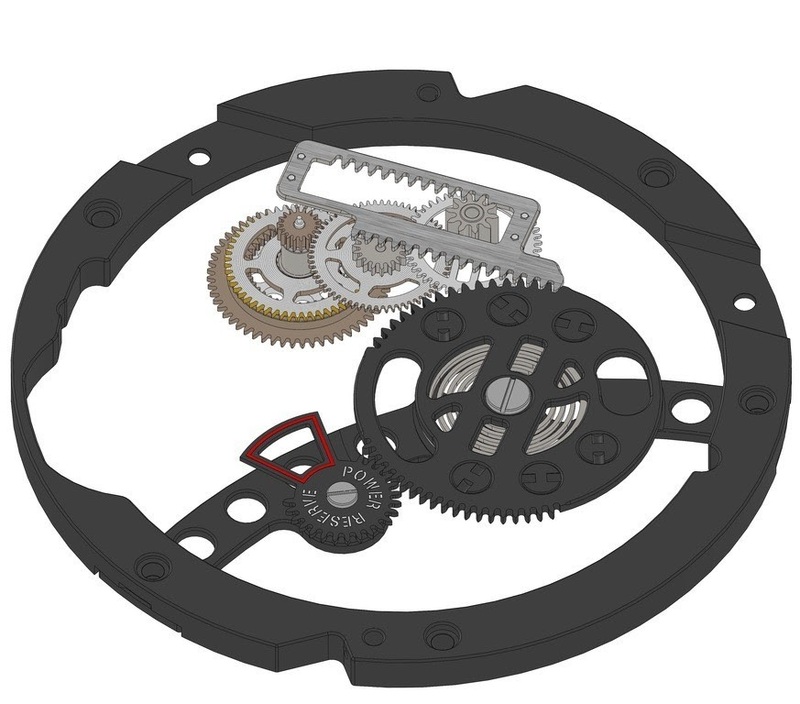 A large pinion (marked in red in the following picture), connected via the gear train with the planetary gear and the barrels, drives the racks. 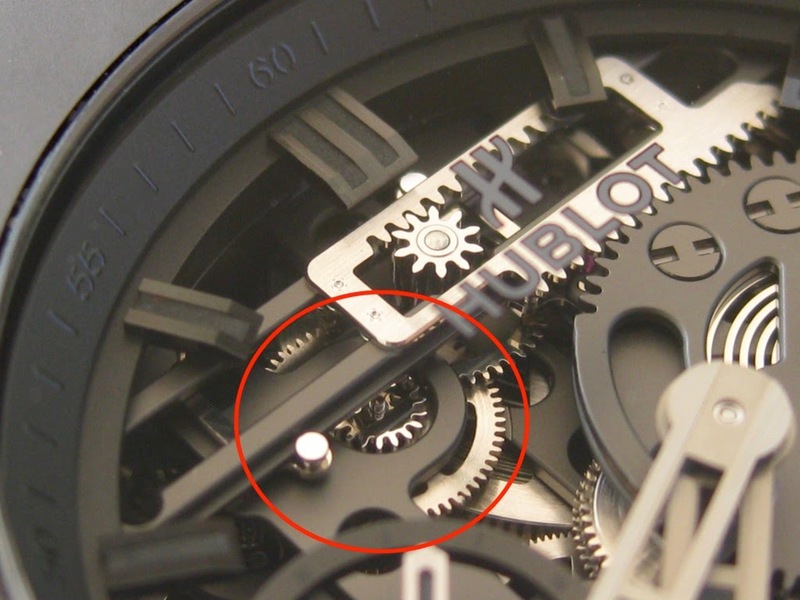 About the racks, the other parts of the power reserve indicator are controlled in their function. 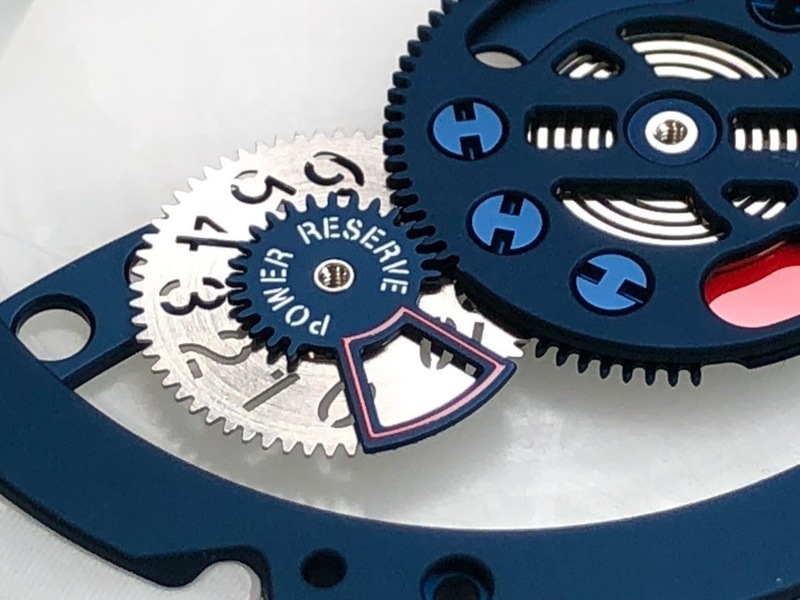 In order to understand the power reserve indicator in its function and construction, we best follow the assembly of the power reserve mechanism. It all starts with a circumferential ring as a static basis for the mechanism. 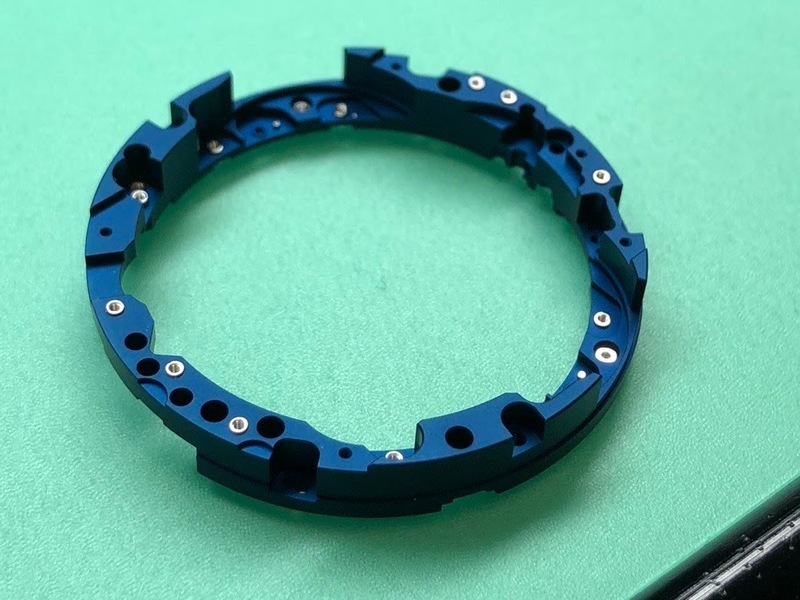 The following picture shows this ring and the first already mounted bridge. 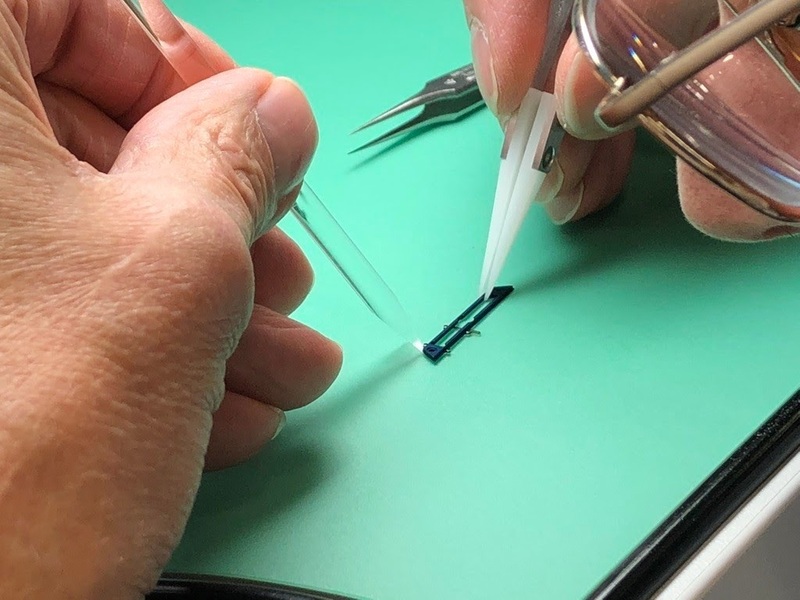 These flat but mostly torsion-resistant bridges are made of beryllium-copper using the LiGA process (see Todds wonderful article about the Unico). 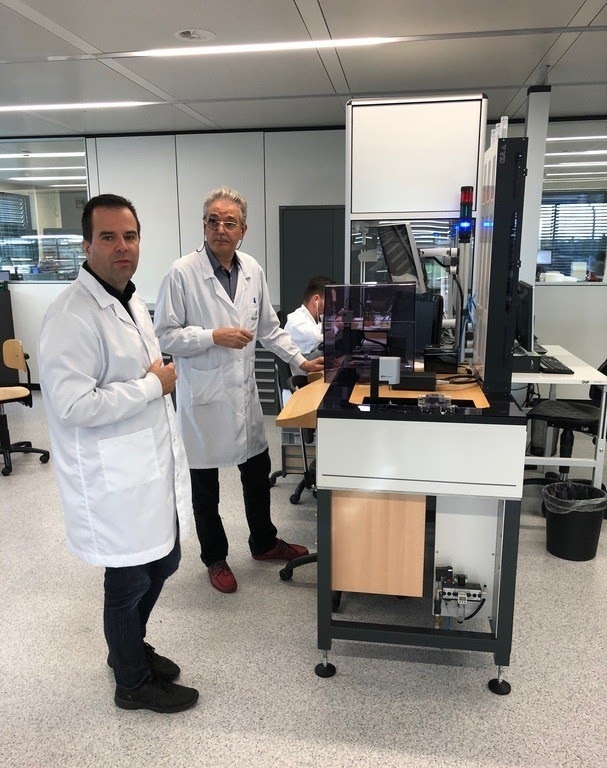 The watchmaker (in this case Jacky Rousselle, one of Hublot's most experienced watchmakers) begins assembling the bridge that will guide the two racks. 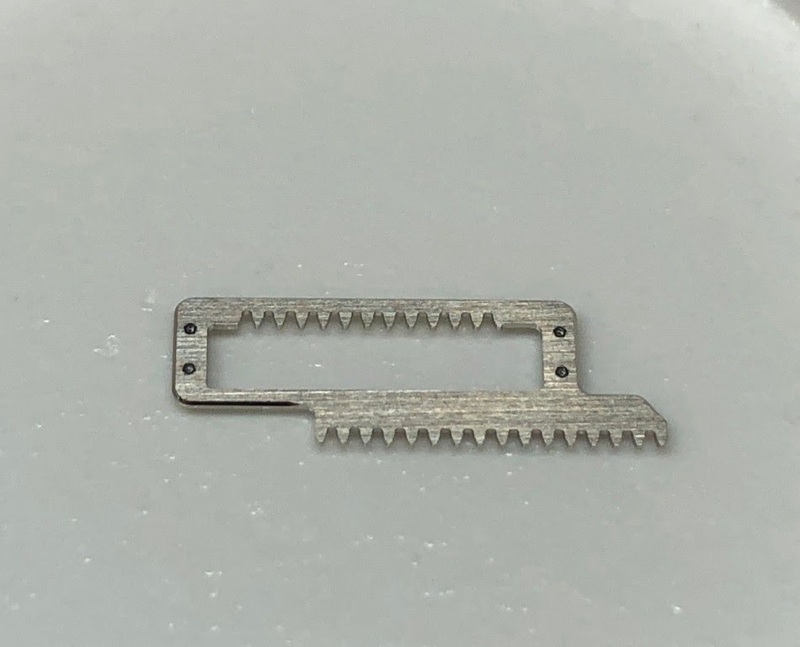 To do this, he attaches the lower rack to the bridge and then fastens it to the ring. In the next step, Terry attaches the upper rack. 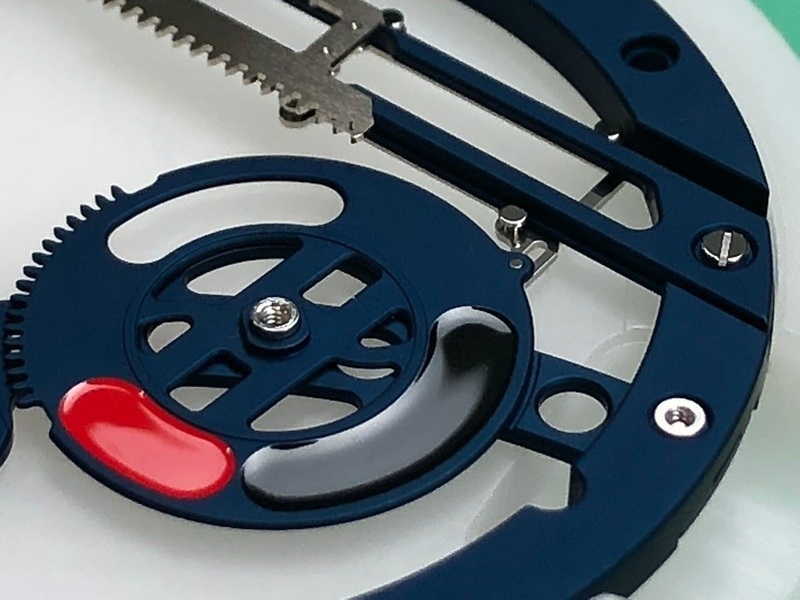 He continues with the wheel at three o'clock, that indicates the power reserve in colors. Again, we have to talk about two wheels. 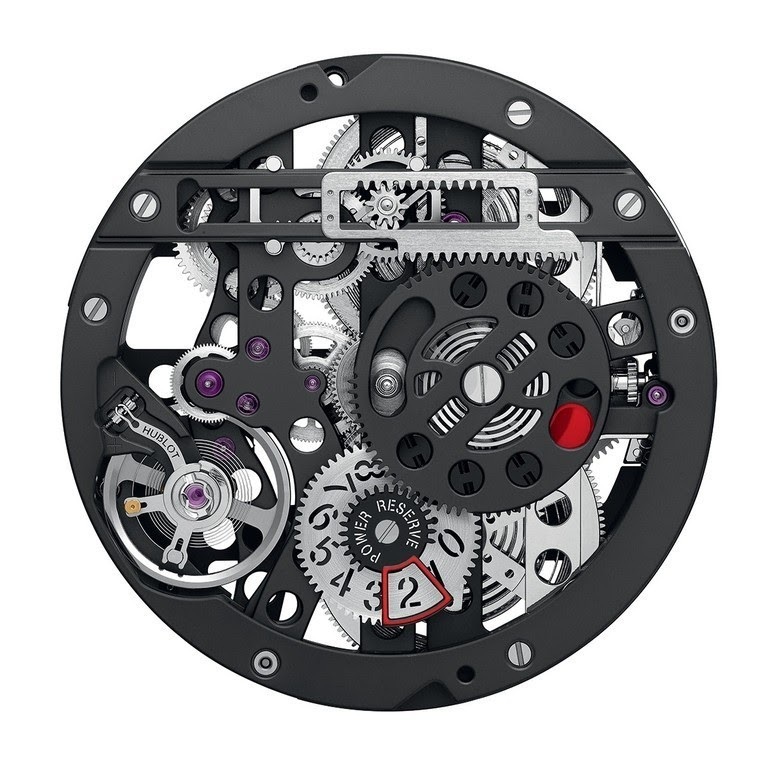 The power reserve mechanism is constructed throughout on two levels. So at first we need the wheel of the lower level. This is hinged to the lower rack and attached to the bridge. 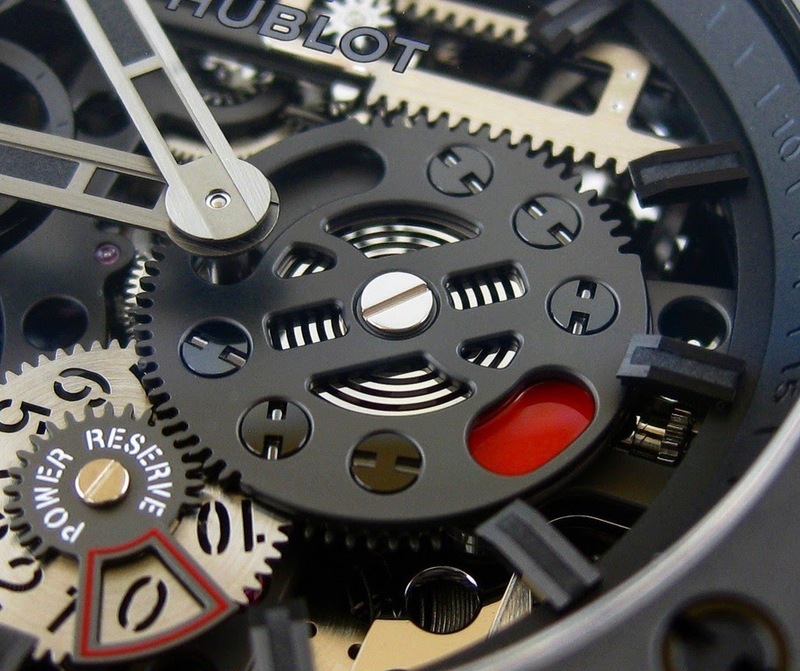 The red indication will later show up when the remaining power reserve is less than 3 days. 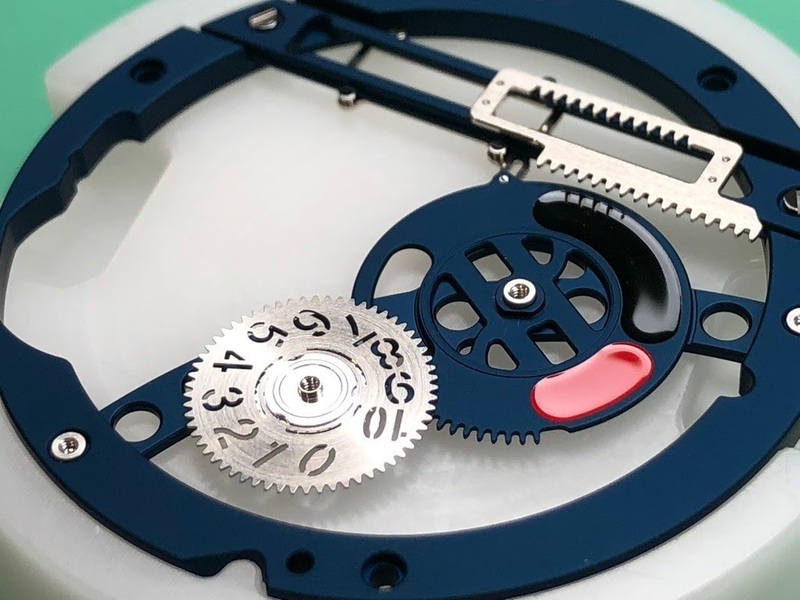 In the next step Jacky assembles a wheel at 6 o'clock, where the remaining power reserve can be read in days. Jacky has completed the lower level of the power reserve mechanism. It consists of the lower rack and the two lower wheels at 3 and 6 o'clock. Next, he sets the upper wheel at 3 o'clock and attaches it to the bridge. 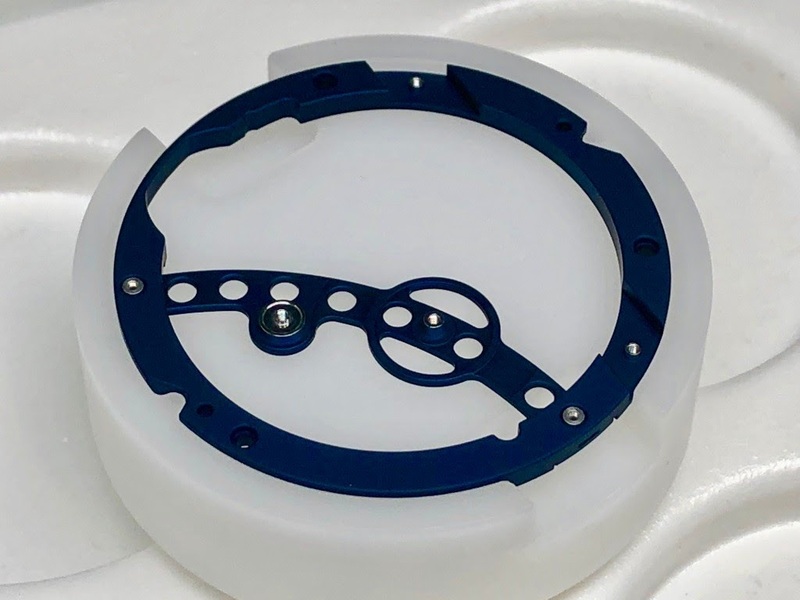 ... and it will drive a small window at 6 o'clock, which will be mounted in the next step. 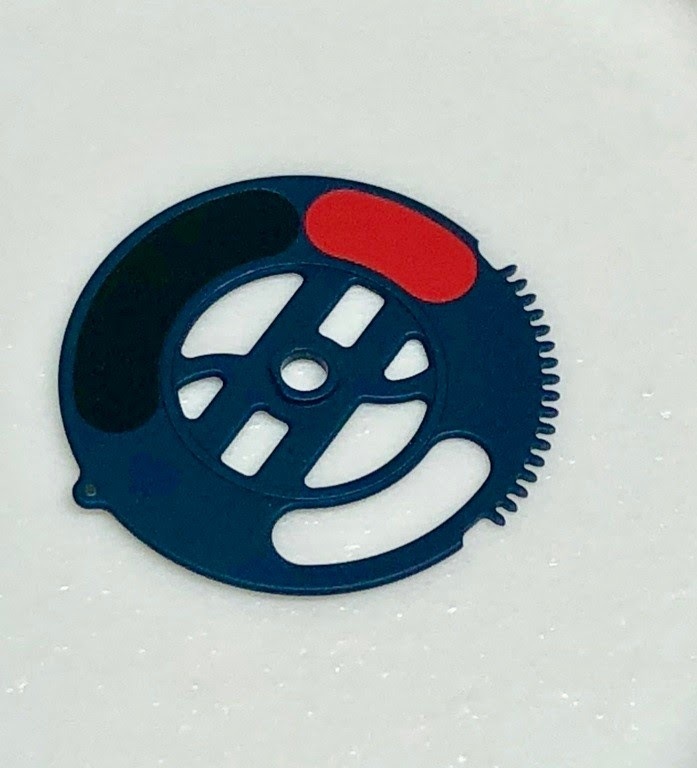 The following two pictures show this wheel from both sides. 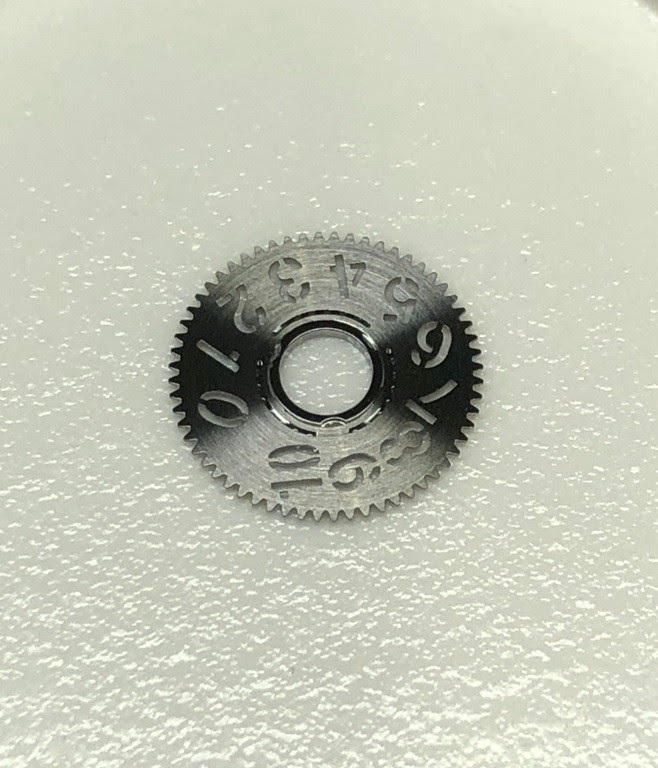 The big spiral spring that belongs to this wheel is nice to see and eliminates the backlash between the threads, in which it keeps all wheels constantly under tension. 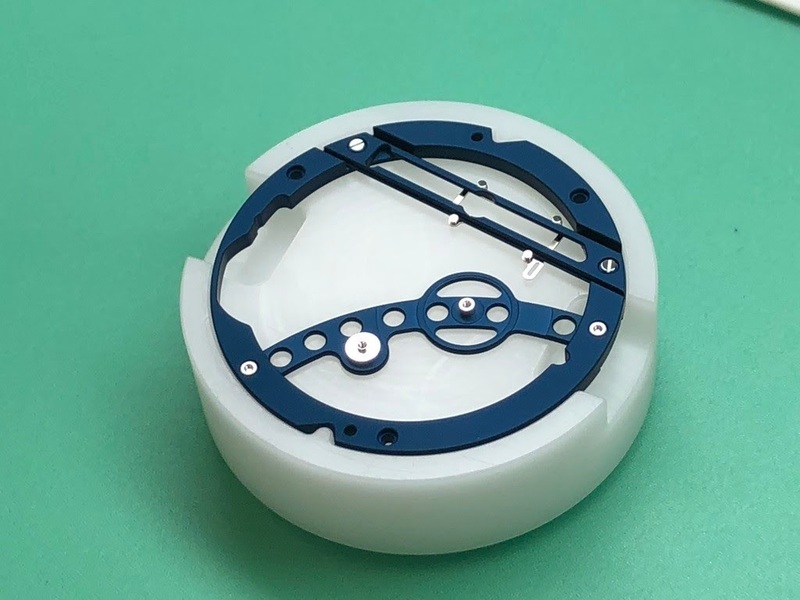 You can also see the spring very well in the fully assembled clock. 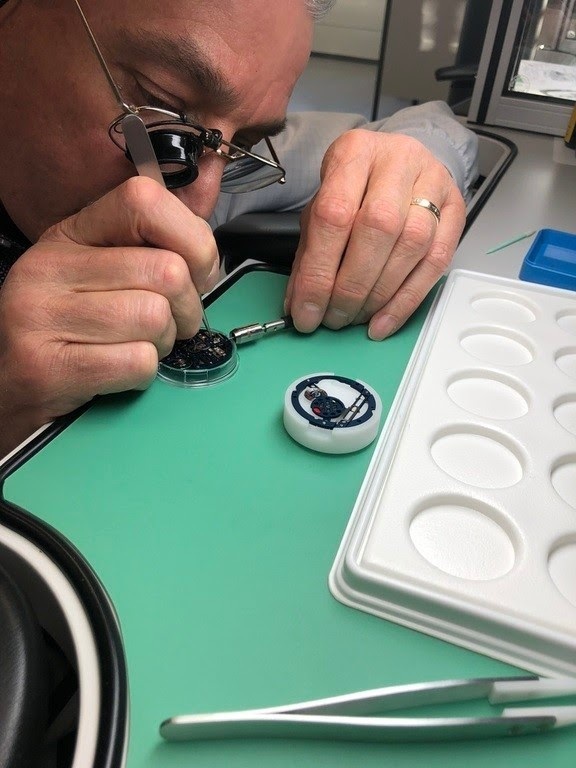 In the final step of assembly, Jacky sets a small window at 6 o'clock, which together with the wheel below shows the power reserve in days. 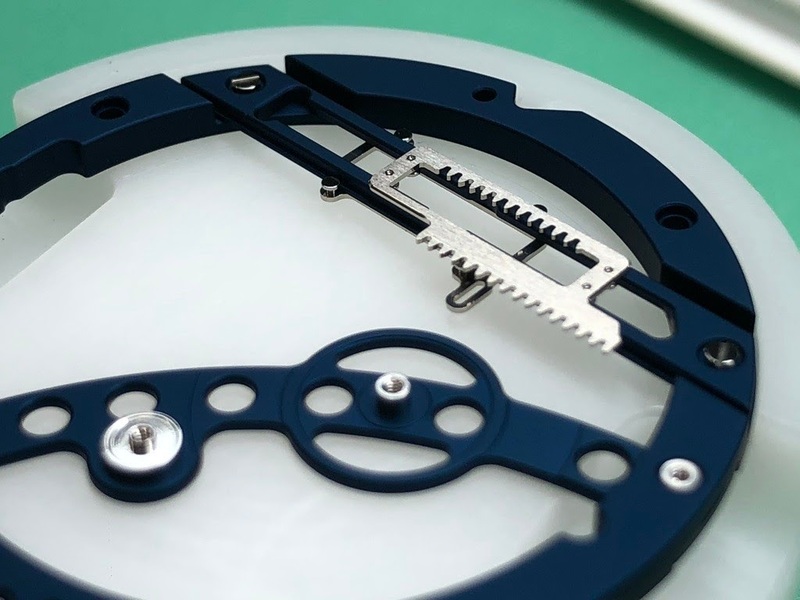 This window also moves when winding the watch and also when the power reserve expires. 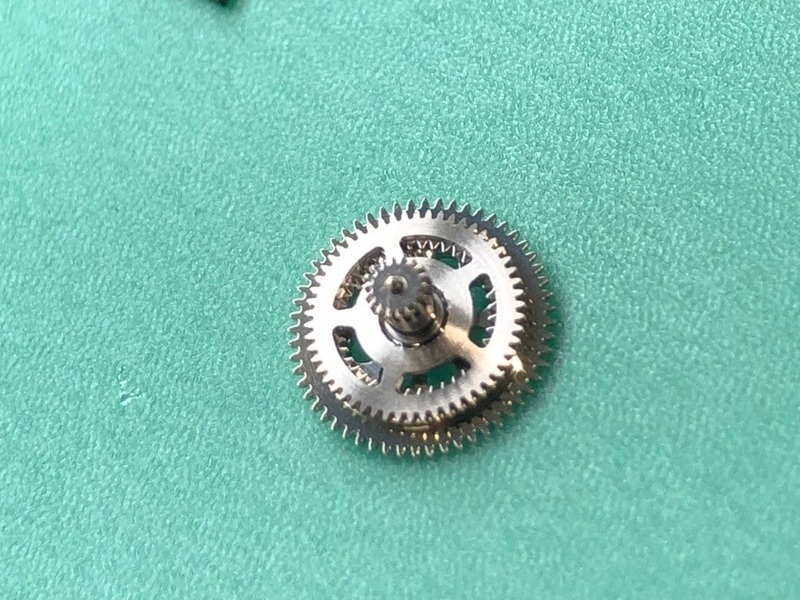 The same detail in the finished watch. 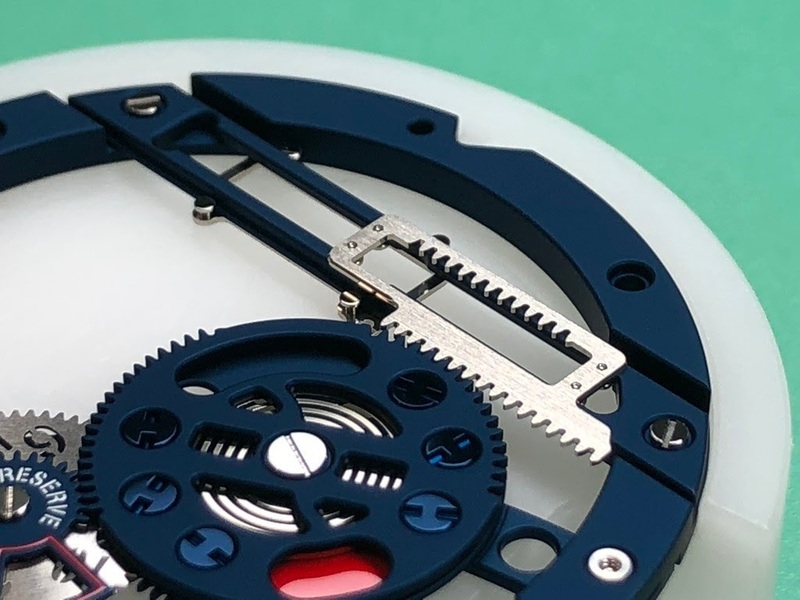 This complex mechanism of the power reserve indicator thus operates on two levels, both of which are each driven by the racks and rotate in opposite directions. 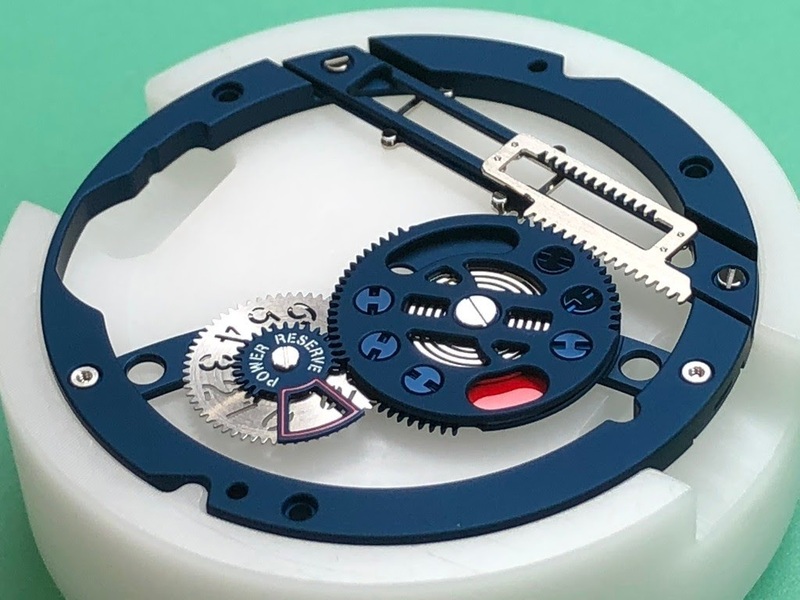 At the end of the assembly, the power reserve mechanism (left in the picture) is placed and fixed on the base movement (on the right in the picture). 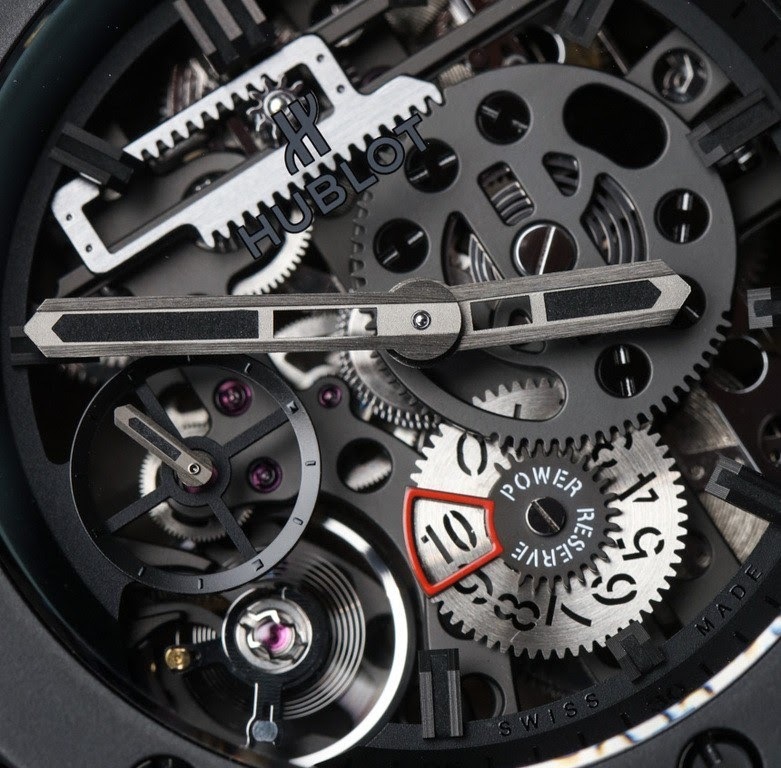 There are certainly much easier ways to indicate the power reserve of a watch. 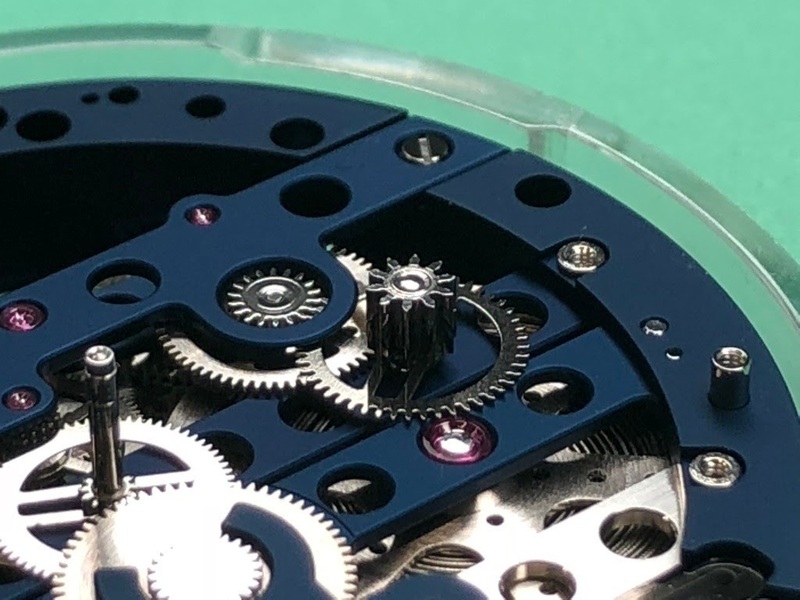 But for an extraordinary caliber like the HUB1201 of the Meca 10, this construction is certainly adequate. 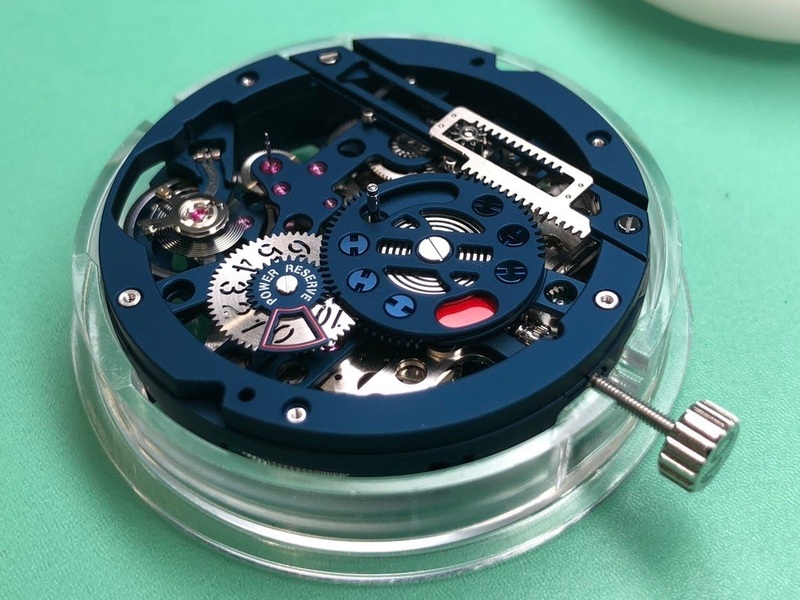 In addition, it makes it absolutely enjoyable to look at the watch, for example while winding it up. 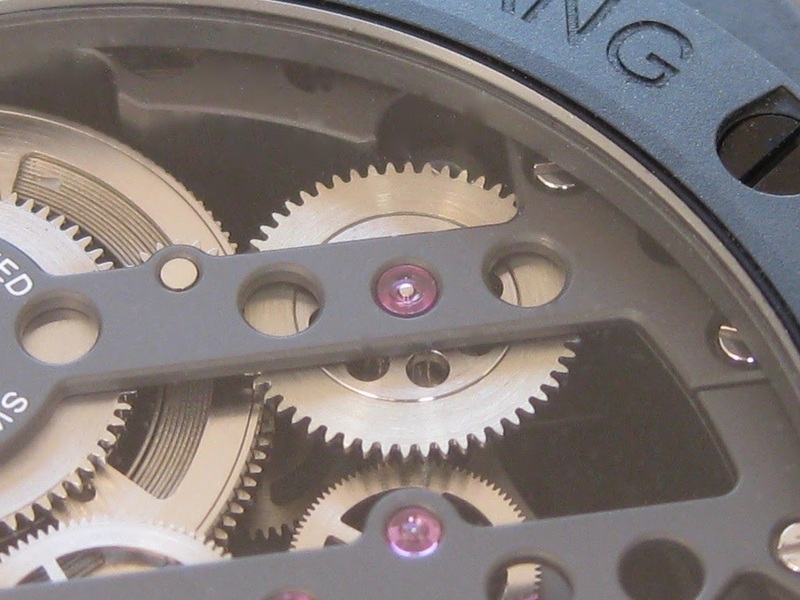 Among other things, that's why the Meca 10 is one of the most exciting three-hands watches currently for me. 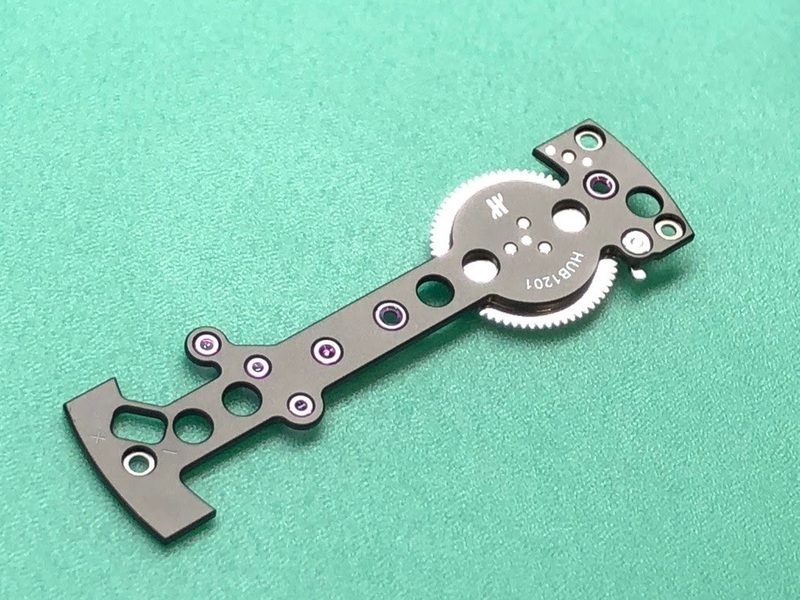 But also the rest of the movement impresses with unusual technical solutions. More in a separate article. Thank you Sasha for this great post! A lot of technology often overlooked and under appreciated. Quite a post, thank you! This model has tempted me before. Just a good old base titanium for me. I loved it when I tried it on.